Strength of the Sword 3 has been developed by Ivent Games, a small – in fact miniscule – team of just two Bulgarian developers (Georgi Rakidov and Lyubomir Iliev). The game’s title is misleading as this is in fact the first Strength of the Sword game, not the third of a franchise, as the developers say they won’t make sequels to any of their games – so they complete a trilogy right away. So can this two man team justify Strength of the Sword 3 as the franchise it makes out it is? Looks can be deceiving, as this game is rock hard! Indie titles are becoming more and more important with this generation of consoles, and the recent E3 showing of the next gen systems shows that they will be even more relevant when the PlayStation 4 and Xbox One arrive at the end of this year. This gen has seen many classic indie titles, and Strength of the Sword 3 is certainly not as instantly likeable as games like Journey, when it features third person combat which is especially unforgiving. In fact to quote the developers “it never gets easier, you just get better”. The story behind the game is a simplistic plot involving the Dark Mechanism that is threatening your world, by unleashing evil creatures to wreak havoc upon it. You are The War Golem, who is tasked with eradicating this scourge from the world. If you expect a story like The Last of Us then you will be disappointed as Strength of the Sword 3 is really just about taking down the waves of enemies with your trusty sword and shield, and your alternative attacks, such as using throwing knives or Dragon Breath, which involves spewing flames towards your foe. When you fell a new enemy you learn new abilities, and are given new weapons to play with like Rocket Launchers and Grenades. These abilities are selected from a wheel system, and this keeps the combat fluid and fun. Your sword and shield can be upgraded, as can your secondary attacks, and there are finishing moves which can have a devastating effect on enemy combatants. 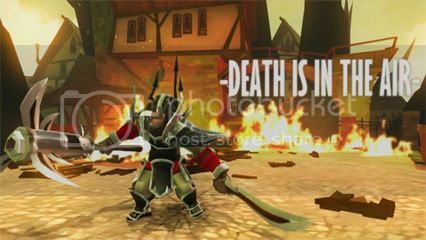 Death is always in the air in this game! The game features 12 levels, which consist of arenas filled with opponents who get increasingly trickier as you progress through the game. The arenas also have interactive hazards like fires or machinery that pulls you in and crushes you. The problem is that the game doesn’t ease you into the flow of things, but drops you into a game whose difficulty rivals Demons Souls or Dark Souls right from the start. If you’re the type of gamer who button mashes their way to victory, then this game isn’t for you. The game boasts an adaptive AI system, which means that repeating the same attack patterns will eventually be repelled by an ever-evolving foe. So you need to be clever with your attacks by varying the moves, and exploiting your enemies’ weaknesses. Most moves require you to charge up your Mana, and the only way of doing that is to stand still and hold up your shield and push up. This makes timing crucial to your attacks in the game. Thankfully the controls are tight, and it won’t be long before you are pulling off some pretty impressive combos, along with using your defensive moves to exploit enemy weaknesses. It starts off pretty tough, and is relentless in upping the challenge, with ever larger foes who have an increasing repertoire of moves to deal with. However it is always fair, and inspires you to keep replaying a fight until you eventually overcome your foe. There are issues with the targeting system of the game, and sometimes the camera gets stuck behind scenery which makes the fight all the more difficult, as you wrestle with the camera as well as your enemy. The graphics may be simplistic, but it can look beautiful at times. 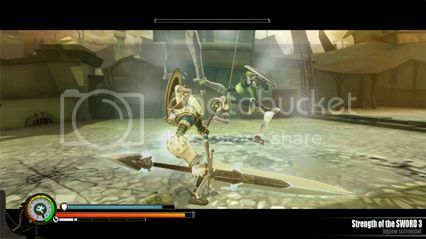 Strength of the Sword 3 also features a Challenge Pit, which is similar to the main game but offers different difficulty levels and is against the clock, which makes it an even more intense experience. As you progress you rack up points which increase the time limit, and are used to upgrade weapons and gear. One downside to this mode is that it only takes place in one arena, which can get quite monotonous after a while. The addition of online leaderboards adds an extra layer of competitiveness to the game, for those who like to earn bragging rights against friends. We actually recommend playing the Challenge Pit first, as items unlocked in it can be transferred over to the main game, which will help you on your quest. Strength of the Sword 3 is an impressive feat for such a small developer. The graphics may be simplistic, but they have bags of character, and an old school PlayStation 2 feel to them. The gameplay has a lot of depth, and oodles of replay value. The game is a challenge which may test the patience of many with its old school gameplay, but if you stick with it there is a lot to like about Strength of the Sword 3. You just may end up breaking a few controllers before you get there!